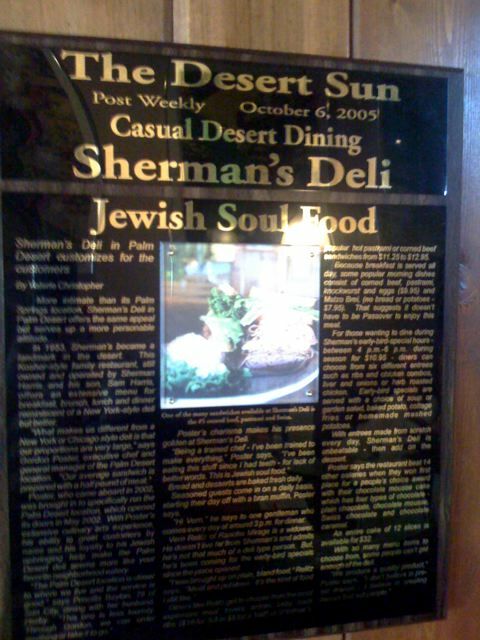 We recently met some folks in Palm Creek who, when learning that we were going to spend time near Palm Desert, told us that we just had to eat at Sherman's Deli. Well we're not going to pass up a recommendation like that so today we made the short trip from Indio to Palm Desert for a culinary delight. This was some tasty comfort food!! After taking our order, the waitress asked if we wanted pickles - well, sure!! She brought them immediately and if you think we are waiting for the food before we indulge, you don't know us very well!! 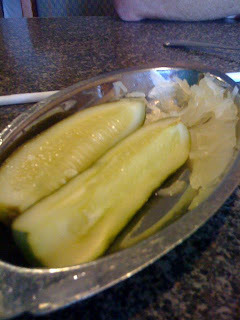 The pickles were briny and crisp and peppery. Oh and that other stuff is what was left of some really yummy sauerkraut that JC chomped on before I got my Iphone out to take pictures. I ordered latkas because I LOVE latkas. These were huge and OK. I actually have made better latkas as JC was quick to point out, but they were good enough and I didn't have to mess with the grating and pressing out the water and saving the potato starch, etc. 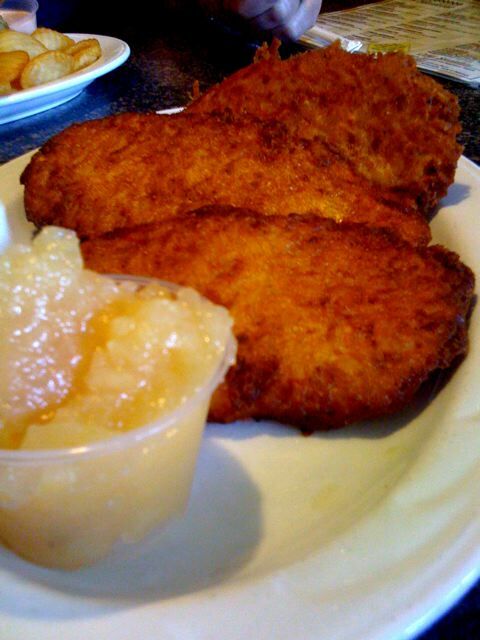 The applesauce was homemade and excellent! But this . . . THIS . . . was a work of art!! 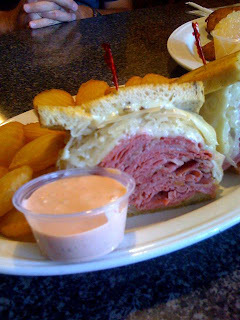 The Reuben was grilled to perfection and piled high with corned beef, a layer of swiss and just the right amount of kraut. The meat was tasty and very tender. They even served the Thousand Island dressing on the side much to JC's delight! Sherman's Deli in Palm Desert - order the Reuben - you won't be disappointed!! I do remember your latkas....they were fabulous! :-) Post the recipe when you have time! This is the recipe I use - from Martha, I not ashamed to admit!! Yes, mom made the BEST latkas!! I love that it was "Jewish Soul Food"....too cute! Your iphone takes good pictures.